CanaQuest Medical Corp is engaged in the development of proprietary research and products utilizing cannabis oil combined with other botanical and nutraceutical extracts, including algae oil. Positive data from our research and pre-clinical trials has demonstrated that our strategy is achieving meaningful results. The company has engaged two prestigious Canadian universities, Western University and the University of Waterloo, to provide research, and to create these formulations and products, where research is focused on the development of our novel pharmacotherapies for mental health and mitigation of the spread of cancerous tumors respectively. Novel pharmacotherapies for mental health. 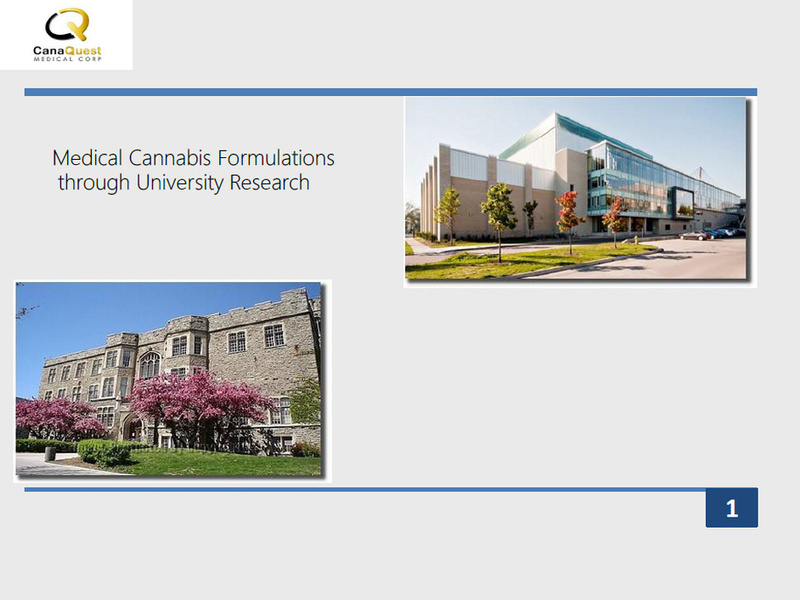 First focus: examining cannabis oil and its constituents in the context of anxiety, depression, schizophrenia, and post-traumatic stress disorder (PTSD). Second focus: formulations for pain management as an alternative to opioids, which will have clinical implications for a host of other ailments, such as nausea, glaucoma, multiple sclerosis, osteoarthritis. Mitigating the spread of cancerous tumors. Formulations to enhance the efficacy of cancer treatments. Focusing on modulating cellular behavior to reduce the capacity of cells to form aggressive disease and/or spread throughout the patient (metastasis). Preclinical models have identified formulations that have the potential to change cellular properties that contribute to the progression of cancer. We are now moving to apply this work to veterinary and human trials and to determining the best oral delivery approach. Strategic International Licensed Producer/Processor/Distributor: We have executed a Master Cannabis Supply Agreement for medical cannabis product supply and a preliminary Production-Distribution Agreement with Jamaican Medical Cannabis Corporation (“JMCC”), JMCC is a Canadian-headquartered group of companies with rapidly expanding medical cannabis operations in Jamaica. Providing a range of cultivars sun-grown in specially designed greenhouses at various locations around the island, JMCC also offers an integrated and customizable outsourcing solution for the global medical cannabis industry, including processing/extraction, testing, global warehousing and distribution. Led by an international executive team with in-depth experience in highly regulated industries, JMCC provides premium medicinal cannabis and associated services to licensed producers and other industry participants to free them to focus on creating and delivering the best products for patients. Licensed Producers: We have engaged in several discussions with major Licensed Producers/Distributors to sell medicinal cannabis domestically and Internationally (supplied by JMCC). As well, these companies are reviewing the strength of our IP to potentially facilitate the processing and distribution of our formulations because our formulated products do not compete with their product lines. Licensed Processor/Pharmaceutical Company: We have engaged in several discussions with a major pharmaceutical company, international distributor and GMP manufacturer who has provided highly positive feedback of the approach Dr. Laviolette has adopted in his research and pre-clinical animal trials, the depth of research and the effective integration of the various research departments at Western University. We believe we can leverage their expertise with multiple formulations, delivery systems for improved bioavailability, including by integrating our formulation into soft gels and tablets for timed release of the formulations. We would also expect to take advantage of their supply, processing and distribution capabilities and collaborate further on R & D and human trials for our formulations. We have reviewed our strategy and believe it is more efficient to partner with existing Licensed Producers who have facilities compliant with good manufacturing practices (GMP) necessary for the preparation of our formulations. Additionally, we are seeking our own purchase/sales, import/export license without possession under the Cannabis Act to distribute formulations and develop our brand as permitted under the Cannabis Act Regulations. We have included a full description of the cannabis-related licensing process at the end of this Business Description section for further information and disclosure. We do not require similar special licensing with respect to algae related sales.